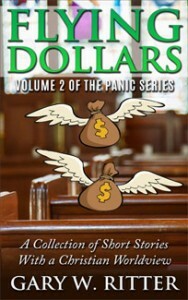 Flying Dollars is the second of three books, each of which contains a collection of twenty short stories. Each story is a very short read of only two to three minutes. All were written in response to a Christian writing challenge contest over the course of a year. They provide an eclectic range of fiction from drama, suspense, humor, social and political commentary, to take-offs on Biblical stories. These stories provide a look at life through a Christian worldview, which is a framework of ideas and beliefs that a follower of Jesus Christ often uses to interpret the world and interact with it. If a person sees life through the lens of Scripture, then he’s using a Christian worldview. “I’ve heard some grumbling lately,” Deacon Barnes said. “Grumbling? You mean gossip?” I asked. “Oh my.” I was a younger pastor who had come into this older, well-established church determined to theologically shake things up. In my zeal I hadn’t considered the ramifications. In our meeting we had just reviewed the church budget. Our finances weren’t good. Membership had been dropping with expenses skyrocketing. Several years before I came to the pastorate the Board had approved an adjustable rate mortgage. It had adjusted dramatically upward. Because of that and unexpected major repairs to our building we were in trouble.